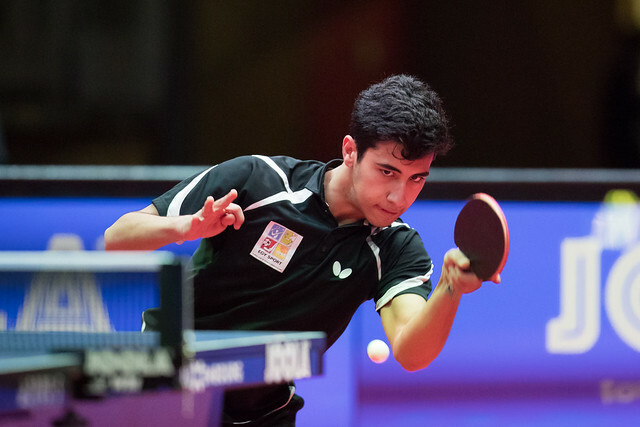 The winner in Egypt, ninth position on the end of year Standings, Denis Ivonin emerged as the player to cause the biggest upset as the second series of matches in the group stage of the Boys’ Singles event progressed on the evening of Friday 2nd February at the Luxembourg 2017 ITTF World Junior Circuit Finals. Occupying the no.6 seeded position, he beat Romania’s Rares Sipos, the no.4 seed (11-7, 11-7, 3-11, 11-9, 11-6). A surprise win, perhaps not; in Egypt he had beaten Rares Sipos in the final of both the Junior Boys’ Singles and Junior Boys’ Team events. Furthermore, the win means that Denis Ivonin ends the day as the only unbeaten player in the group; for Rares Sipos and Sharon Alguetti of the United States, it is one win each. Earlier in proceedings, Rares Sipos had overcome Argentina’s Francisco Sanchi, the no.11 seed (11-5, 11-8, 11-3, 11-3), an outcome which Sharon Alguetti, the no.14 seed, emulated but in a much closer duel. He prevailed against the Argentine teenager but needed the full seven games (11-8, 11-3, 2-11, 11-4, 2-11, 4-11, 11-6). Francisco Sanchi now faces Denis Ivonin in the concluding group stage contest; Rares Sipos opposes Sharon Alguetti. Defeat for Rares Sipos but there was success for Romania. Cristian Pletea, the no.2 seed, beat Russia’s Artur Abusev, the no.8 seed, by the very narrowest of decisions (11-9, 4-11, 11-9, 6-11, 5-11, 11-8, 11-9) and thus ended the day unbeaten. Success for Cristian Pletea, in the same group India’s Manush Utpalbhai Shah, the no.9 seed, kept quarter-final hopes alive. Having lost to Cristian Pletea earlier in the day (11-4, 5-11, 13-11, 11-9, 11-8), he recovered to beat Luxembourg’s Ademir Balaban, the no.15 seed (11-9, 7-11, 11-7, 11-4, 9-11, 11-5), the surprise winner earlier in the day over Artur Abusev (11-6, 11-7, 12-10, 11-8). In the concluding group matches Cristian Pletea plays Ademir Balaban, Artur Abusev meets Manush Utpalbhai Shah. Cristian Pletea is the favourite for top spot but nothing is official; it is the same for Egypt’s Youssef Abdel-Aziz, the no.10 seed who in his opening match beat Kanak Jha of the United States, the top seed (5-11, 13-11, 11-3, 7-11, 6-11, 11-6, 11-7). He continued his good form to overcome Australia’s Rohan Dhooria, the no.16 seed (11-4, 11-7, 11-5, 11-5). In his concluding group phase engagement, he meets Frenchman Bastian Rembert, the no.7 seed; after accounting for Rohan Dhooria (11-4, 11-4, 11-1, 11-6) he was beaten by a rejuvenated Kanak Jha (11-8, 11-6, 11-7, 12-10). Main draw places to be decided, for India’s Manav Vikash Thakkar, the no.3 seed, a quarter-final place had been reserved. He beat Chinese Taipei’s Feng Yi-Hsin, the no.5 seed (11-5, 11-4, 8-11, 4-11, 11-2, 11-2). Second place in the group now rests on the duel between Feng Yi-Hsin and Austria’s Maciej Kolodziejczyk, the no.12 seed; like Feng Yi-Hsin, he ended the day with one win to his name. In his opening day concluding contest, he beat Thailand’s Yanapong Panagitgun the no.13 seed (4-11, 11-3, 11-6, 2-11, 11-5, 11-5). Players finishing in first and second positions in each of the four groups advance to the last eight. The group stage of the Boys’ Singles event concludes on Saturday 3rd February.